Flora’s mother doesn’t like her reading comics, she is a romance novelist and feels comics are not appropriate literature for Flora. Then an unfortunate incident leads to Flora witnessing the birth of a superhero. It begins with a vacuum cleaner, and a squirrel who never saw it coming. The squirrel wouldn’t have stood a chance really, if Flora wasn’t around. Having read every issue of Terrible Things Can Happen to You! she knows exactly how to save him, and in doing so the squirrel, now called Ulysses, is born anew, with powers of strength, flight, and poetry. However like all good superheroes Ulysses must have an arch nemesis, can Flora and Ulysses enlist in the help of others to battle this evil force? When I heard about Flora & Ulysses at the Walker Roadshow event in June I knew it was a me kinda book, I just had to have it! Thankfully with its release date now not far away I managed to bag a review copy and swallowed it whole in just two sittings, I can definitely say I was right! The story is fantastic, its a true superhero story with some interesting curveballs and some amazing comic strip style entries from KG Campbell. These added so much fun to the story and even though the art wasn’t completely finished in my copy as it was an ARC I could still see how awesome it is going to be. I love graphic novels and this is the first time Ive read a book that switches between Novel and Graphic Novel but it does so seamlessly and it works. You get more out of the story, you can see everything and you can love it all the more. There is more than just a superhero being born going on in Flora & Ulysses, you find out a lot about what its like to be Flora and her strange relationship with her mum, what makes people act in the way they do, how much family means and is important and just how much you don’t realise that the people who love you, really do love you. I absolutely adored Dr Meescham and even William Spiver was the sweetest character at times, even if he was a little annoying… but his part in the story was brilliant. I couldn’t get enough of Ulysses and he reminded me a lot of another rodent in another series that I haven’t read in a long time. My favourite manga series MegaTokyo has the best little hamster in it and I think Ulysses and Boo would get on so well! I obviously have a thing for intelligent rodents! Flora & Ulysses is aimed at the 8 to 12 market but in all honesty I don’t think teens and adults should miss it. Its a beautiful story full of things we need to be reminded of with an element of silliness and fantasy. Obviously a squirrel brought back to life after being vacuumed won’t have superpowers but there are things we should take into account about being human in this book that we may just forget about otherwise and Flora helps us see that sometimes you need to step back and see the bigger picture before alshing out, saying things you don’t mean or being too busy for those around you. 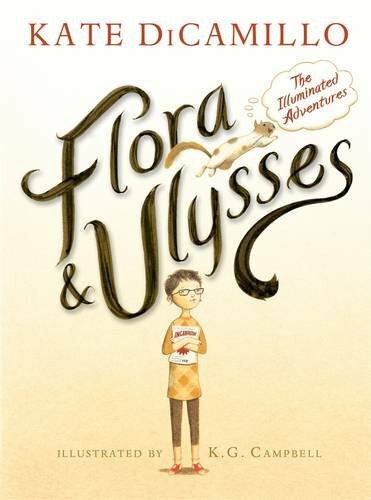 I adored Flora & Ulysses and especially the messages they brought to me through their story, I want my own little Ulysses and I really hope that this book is as well received as it deserves to be when it is released next month. Flora & Ulysses will be published on October 3rd by Walker Children’s Books. My copy was sent in exchange to me by the publisher in exchange for an honest review.